Dress her to impress in this set that comes with everything she needs for an adorable rocker-chic ensemble. This 2 pieces set comes with Dress and leggings. Perfect for girls Daily wear, casual, winter, christmas and everyday wear. 2 Piece Girls Clothing Pant Set. 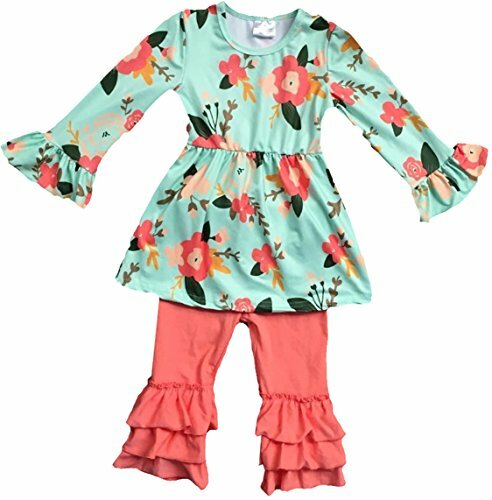 Comes with Long Sleeve Ruffle Dress and solid ruffle legging. Comes in Size 2T, 3T, 4, 5, 6, 7, 8. 97% Cotton. Perfect for any Occasions, Birthday, Party Outfits , Banquet, Playwear, Beach and School. If you have any questions about this product by BluNight Collection, contact us by completing and submitting the form below. If you are looking for a specif part number, please include it with your message.